Take exit 247 of the Turnpike (Harrisburg east) and go north on I-283 to I-83 northbound. Stay in center lane approaching the large interchange and do not follow signs to go left toward Harrisburg, or right toward Hershey! Take I-83 to exit 48 (Union Deposit) and follow local directions (A) below. Take Rt 15 north towards Harrisburg to Rt 581 east towards Harrisburg. Take Rt 581 to I-83 northbound. Continue to exit 48 (Union Deposit Rd) and follow local directions (A) below. Take I-83 north to exit 48 (Union Deposit Rd) and follow local directions (A) below. Bear right at top of exit ramp onto Union Deposit Rd eastbound. Make a left at the second traffic light after the exit ramp (Rutherford Rd). At the next traffic signal, turn right (Locust Ln). Proceed thru next traffic light (Prince St) and begin watching for bowling lanes on the right. Approximately 300 yards past the bowling lanes, you will see our sign on the right. Turn in a full 90 degrees at the sign. Take I-81 east to I-83 south to Hershey. Take the second exit ramp after joining I-83 (approx 1/2 mile beyond merge—exit 50/ Rt 22 east/ Colonial Park) and proceed eastbound on Rt 22. At third traffic signal (Houcks Rd) turn right and stay left onto Prince St (Houcks Rd runs off at an angle greater than 90 degrees to the intersection). Turn left at the next traffic signal (Locust Ln) and start looking for bowling lanes on the right. Approximately 300 yards past the bowling lanes, you will see our sign on the right. Turn in a full 90 degrees at the sign. Take I-81 south towards Harrisburg to exit 72 (Paxtonia) and stay left on the exit ramp. Turn left at the top of the ramp (Mountain Rd) and get into the right lane. Bear right just before next stoplight onto Rt 22 west and follow Local Directions (B) below. Take I-78 west to I-81 south. Take I-81 south toward Harrisburg to exit 72 (Paxtonia) and stay left on the exit ramp. Turn left at the top of the ramp (Mountain Rd) and get into the right lane. Bear right just before next stoplight onto Rt 22 west and follow Local Directions (B) below. At the 8th traffic light after entering Rt 22 (Prince St / Houcks Rd), turn left 90 degrees onto Prince St (Houcks Rd runs off at a less than 90 degree angle from the intersection). Turn left at the next traffic signal (Locust Ln) and start looking for bowling lanes on the right. Approx 300 yards past the bowling lanes you will see our sign on the right. Turn in a full 90 degrees at the sign. For a complete list of upcoming services, please visit the monthly Calendar at the bottom of the parish website. 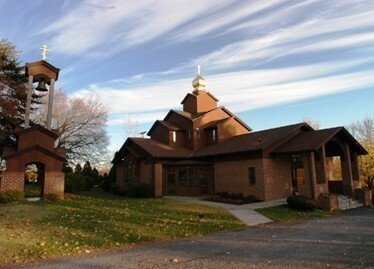 Christ the Saviour Orthodox Church, a parish of the autocephalous Orthodox Church in America/Diocese of Eastern Pennsylvania, is the first in the capital region of Harrisburg conceived as a specifically pan-Orthodox, multi-ethnic, and English-serving community. From just a few dedicated families using a leased Protestant house-chapel in 1963, the parish has developed and grown over the last 40 years, spiritually and numerically, into a dynamic Orthodox Christian community of nearly 300 adults and over 125 children; the property now includes a relatively new church building with recently completed icon murals, adjacent bell tower, parish hall, rectory and wooded, landscaped grounds. Offering a range of liturgical, educational, and social programs, and undertaking missionary, evangelical and other outreach endeavors, our parish has embraced peoples of every kind: “traditional” Orthodox, converts, the non-Orthodox spouses of Orthodox, children, immigrants, refugees, disabled, and the elderly…all have found a place in our extended family worshiping the Holy Trinity according to the ancient Christian tradition. During the 1950s, a chapter of the Orthodox Christian Fellowship was established in the Harrisburg area with about 20 members. Although this fellowship lasted for only five years, a seed was planted for the eventual establishment of an Orthodox parish in this region. In December 1962, the first organizational meeting, held in a real estate office, was attended by Father Michael Rachko and five founding fathers. They recognized the need for a multiethnic parish that would accommodate the needs of people living in the capitol region, those moving into the area for government employment, as well as those moving away from older areas with poor economic conditions. The founders realized that not all these people were of Slavic backgrounds, and desired to establish an English-speaking parish where all would feel welcome. The petition for the establishment of a parish was accepted by Metropolitan Leonty in January 1963. The new parish was given the name “Christ the Saviour Eastern Orthodox Church” with the Holy Resurrection as its feast day, and placed in the Diocese of Wilkes-Barre. Father Michael Rachko was assigned as parish priest. With the donated services of George W Gekas, Esq., US Congressman (1983-2003), the parish in 1964 compiled its constitution and bylaws based on the Normal Statutes, and was incorporated as a non-profit organization. The first Divine Liturgy was held in a second floor “upper room” at the YMCA in downtown Harrisburg on March 10, 1963. During this early period the parish council worked long hours and held many meetings to resolve various details that new parishes have. One main issue was to find permanent quarters for worship, and in March of that year the parish leased a “house chapel” from Epiphany Lutheran Church in Harrisburg. Many liturgical items and church furnishings were donated from other Orthodox churches and the Lutheran church. During these earlier years the parish began to take shape and grow. Some parish organizations, the choir, and Sunday School were organized. In 1965, Father Michael Rachko was relieved of his duties as priest of the parish. Father Daniel Ressetar, a former US Air Force Chaplain previously stationed in San Antonio, TX, was assigned to the parish on July 1, 1965. Father Daniel retired in 2006 and is attached to the parish as Pastor Emeritus. Father Michael G Kovach, retired from his post at Millersville University, and was attached to the parish in 1986. Fr. Michael passed away July 12, 2013 - may his memory be eternal! In 1965, the parish purchased five acres of property with a Cape Cod home at 5501 Locust Lane in Colonial Park. Settlement occurred on September 14, 1965, and the groundbreaking for a new church was held on October 3 of the same year, with construction beginning shortly thereafter. Some of the work was done by parishioners. On March 28, 1966 the parish celebrated the first Liturgy at the new church. The dedication was celebrated by Bishop Kiprian on April 24, 1966. Over the years, the parish continued to grow rapidly. Several new organizations were formed, providing members opportunities for stewardship and fellowship. Fund-raising activities were held to help defray the mortgage which was “burned” in October 1976. Regular anniversary celebrations were held over the years, along with different special events, lectures, and retreats. Christ the Saviour Church celebrated its twentieth anniversary in November 1983. During this year, a pledge drive was started for the building of a new church. With the financial goals reached, the design of the new church by Father Alexis Vinogradov, a priest-architect, was approved in late 1985. Groundbreaking ceremonies were held on April 6, 1986 by Bishop Herman. Construction commenced later that year, and the first Liturgy in the new church was celebrated by Father Daniel on August 23, 1987. A new Iconostas was constructed, with the icons written by Father Theodore Jurewicz. The old church was renovated into the parish hall. The consecration of the new church was held in conjunction with the parish’s 25th anniversary on September 24-25, 1988. Metropolitan Theodosius and Bishop Herman officiated, along with Father Daniel, Father Michael, and visiting clergy. The following year, Bishop Herman blessed the new bell tower donated by Stephen and Katherine Macut. In 1994, Father Theodore Jurewicz began the project of writing the icon murals for the interior of the church. He finished his work in May 1998, and in October 1998 the icons were blessed in conjunction with the 35th anniversary of the parish. Throughout the years, the parish hosted many events. Among these were retreats, FOCA [Fellowship of Orthodox Christians in America] conventions (both district and the 1994 and 2002 national conventions), winter mixers, dinners, sales, Lenten Mission services, including the Sunday of Orthodoxy, and a Thanksgiving service for the Millennium of the Baptism of Rus in 1998. Some of the honored guests who have visited the parish include Metropolitan Theodosius of Tokyo, Metropolitan Anthony of Chernigov, Archbishop Alexey of Kazakhstan, Archbishop Abel of Poland, Mr. Nicholas Zernov of England, Mother Alexandra of Holy Transfiguration Monastery, Fathers Vladimir Borichevsky, Alexander Schmemann, Thomas Hopko, John Nehrebecki, Paul Lazor, Michael Dahulich, Peter Gillquist and the choirs from St. Tikhon’s and St. Vladimir’s Seminaries. In October 2006 Father Daniel retired after 41 years of active ministry at Christ the Saviour. In February 2007 Father Seraphim Majmudar was temporarily assigned acting rector, while a student at St.Tikhons Seminary. In June 2007 Father Stephen Vernak was assigned to the parish following his graduation from St. Tikhons Seminary, and was formally installed as Rector by His Grace Bishop TIKHON in November 2007. Today, Christ the Saviour Church continues to be a vibrant and active community where all are welcome, regardless of ethnic background. Please worship with us when in the Harrisburg area.